This is our Sunday lunch and believe me its not a typical one. Usually on Sundays, its just simple dal-rice or vegetable pulao for lunch and at night its noodles. Our system is accustomed to this diet. This Sunday however, we enjoyed a North Indian Spread which I am sending to Srivalli’s Indian Thali Mela. She is celebrating 5 years of blogging and here is wishing her many more such years ahead. along with rotis in the center. Dal tadka is the usual toor dal which has been cooked with some vegetables (keeping in mind that its for the baby). In the Paneer Capsicum sabzi, I have also added baby corn as my older kid likes it very much. As you can see, alterations in traditional recipes have been done has per the likes of our special family members – the children. 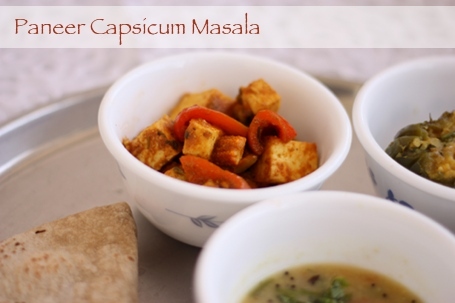 I thought of sharing the recipe of paneer capsicum masala in detail, as its one of the tastiest dishes in this thali. Its also really easy to make and I often end up making it when I have guests over. Heat oil in a kadai. Add jeera powder, dhania powder, haldi powder and garam masala. Before masalas get brown quickly add chopped garlic. Fry for a minute and add maggie bhuna masala. Once the bhuna masala leaves oil from the sides add curd, stirring continuously. Now add the vegetables- onion, baby corn and capsicum. Add paneer cubes and salt. Continue to cook over sim heat for 5-10 minutes. Turn off the heat, garnish with finely chopped coriander leaves and serve hot with rotis. If you don’t have maggie bhuna masala you can make the bhuna masala at home. Just fry 1 teaspoon of ginger-garlic paste in 1 tablespoon of oil. Then fry the paste of 1 onion. Once that browns, fry the puree of two tomatoes. This will give you fresh bhuna (or roasted) masala. What a wonderful feast Roma..so glad that you could do it..thanks! Thanks, Srivalli. I enjoyed participating in the event too. 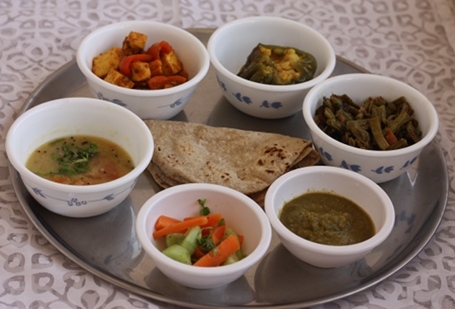 wish i was there in your home to eat this delicious thali. hey! That would have been my dream come true too! Though I’ve dinner at your home just once, that one time is enough for me to vouch for food made by you. Add to that your page giving good instructions and lovely tips. 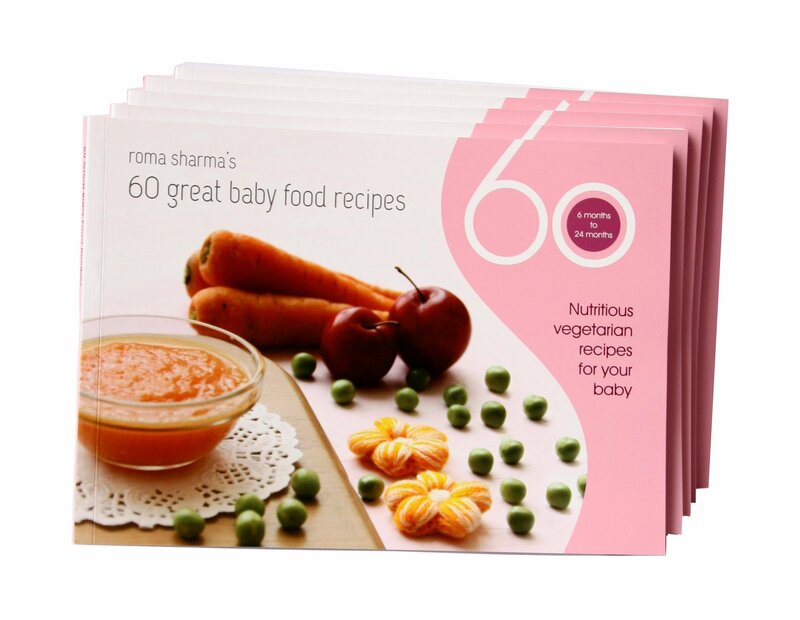 I’m just waiting to get to a good bookshop for your new Baby Food Recipe book. Patna is such a drab city one cant get a new book here yaar! Hi. So nice to see your comment, Sumath. Glad to know that you liked the dinner you had with us. Please do plan to visit us again sometime soon. Take care.